Until it was developed in the 1920s, the area between Depot Road and Lenox Road from Ninth Street south to Vondran Street was home to a one-mile horse racing track featuring a 1500 seat grandstand, a club house, large barns and open fields. Horses had been raced at this site since as early as the 1840s. The Suffolk Racing or Driving Course was a half-mile track that reportedly was the scene of some the first races run by the legendary horse “Lady Suffolk.” These early races featured trotters pulling a driver in a sulky. The track sat on a 47-acre parcel and endured an uneven history with different owners and operators. Races were held sporadically. For example, in 1874, the summer meeting lasted just three days with only two or three races each day. Nonetheless, the meet was popular enough to attract visitors from Brooklyn by way the Long Island Rail Road. After the Civil War, concerns were raised about the future of the track. In 1878, it was suggested that a fair be held at the course—so long as it didn’t detract from the county fair in Riverhead. But it took another decade for the idea to be realized. 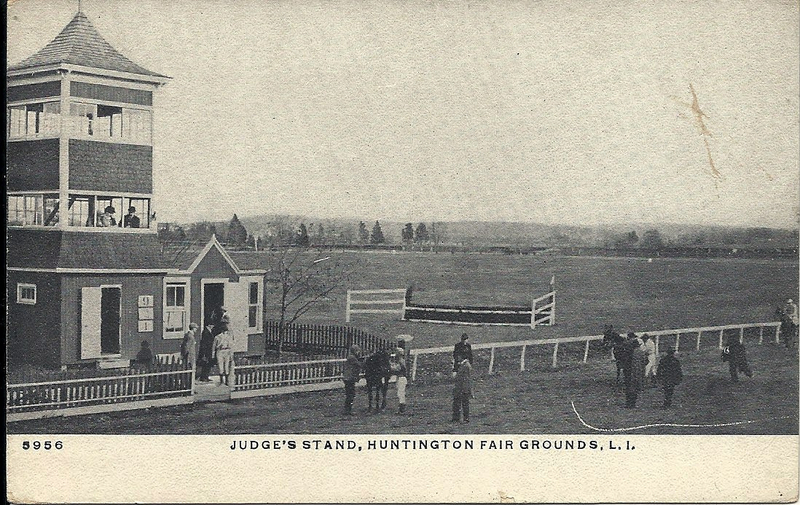 In 1886, Henry C. Brown, proprietor of the Long Island Brewery in Brooklyn and a recent resident of Northport (his home is now the Indian Hills County Club), organized the Huntington Live Stock Fair Association. Despite the Association’s best efforts, the grounds were not ready for the hoped for opening in 1887. The Association had purchased additional land around the track and had made extensive alterations to the grounds and the track itself. By September–when the Association’s first annual fair was held—every pebble had been removed from the track, but racing was not part of the program. The event featured livestock shows, displays of local produce and flowers, samples of bread, cakes, pies and jellies, as well as quilts and paintings. Wagons and carriages, and farm equipment were displayed. Visitors could ride the merry-go-round, have their photograph taken, or watch a baseball game between the Suffolks and the Norwalks. It was a welcome diversion for a town that had experienced a terrible blizzard the previous March and a devastating fire that had destroyed the block of stores known as the Brush Block, a carriage factory, blacksmith shop and the Central Presbyterian Church just a week before the fair opened. But the first day of the fair also featured rain, which turned out to be an omen of things to come. In succeeding years, rain would be a constant problem for the fair’s organizers. Even though the Long Island Rail Road ran extra trains to get visitors to the fair, which was only a few minutes walk from the train depot, rain kept them away. By 1893, the Live Stock Association had defaulted on its debts. A new company, known as the Long island Fair Grounds Association, was formed to take over. The group intended to resume the fairs, but it seems the only activity was horse racing. In 1905, an effort was made to incorporate a new organization—The Huntington Fair and Exhibition Company—to purchase the property and resume the fairs. The grounds were instead purchased by Singleton Van Schaick, son of one of the founders of the Huntington Live Stock Fair Association. In 1921, the old fair grounds were purchased by Addison Sammis, who turned the land over to the Huntington Station developers, Koster & Cornehlsen, who subdivided the land into 20 foot wide lots and began building houses where the horses had once raced. Although the annual fairs did not last, they did give rise to a new name for the surrounding community—Fair Grounds. But that too turned out to be a temporary appellation. In 1911, the name was changed to Huntington Station. I just love these stories about Huntington from long ago!